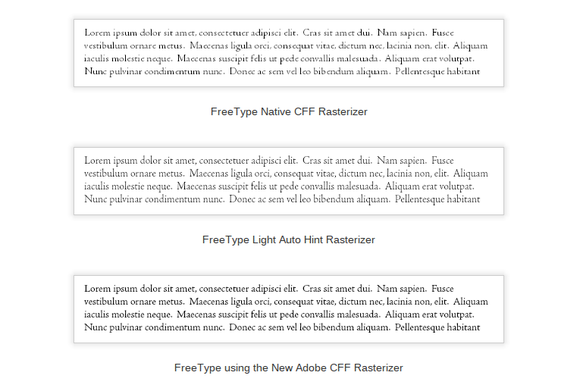 Specifically, Google and Adobe on Wednesday released into beta the Adobe CFF engine, an advanced Compact Font Format (CFF) rasterizer that “paves the way for FreeType-based platforms to provide users with richer and more beautiful reading experiences,” as Google put it in an online announcement on the Google Open Source Blog. The new rasterizer is now included in FreeType version 2.4.12. Though it's currently off by default, the technology is “vastly superior” to the old CFF engine and will replace it in the next FreeType release, the project says. CFF is a descendant of the PostScript font format developed by Adobe. CFF fonts have been popular on the desktop over the last decade, but TrueType, developed by Apple, has typically dominated the Web and mobile devices. "This reflects the legacy of low-resolution monochrome displays, an area where 'superhinted' TrueType fonts could produce better results,” Adobe explained in a blog post. “Hinting” refers to the adjustment in the display of an outline font so that it lines up with a rasterized grid. The new Adobe CFF rasterizer produces more even blackness, fewer blobs, more even and consistent character heights, and fewer dropouts. In any case, with the addition of high-quality CFF font support, mobile developers now will have more fonts to choose from. CFF offers a smaller file as well as a method of hinting that “ensures excellent rendering across a wide range of environments and devices,” Adobe added. In fact, the new Adobe CFF engine is also considerably more faithful to typeface design, Google added. Among the improvements included are better stem widths and placement, fewer dropouts, dramatic reduction in the ‘blobbiness’ of Chinese, Japanese, and Korean, and more even visual weight. The code is now in “mature” beta and available for testing, according to the Git announcement. Users of devices that incorporate the new version of FreeType will now be able to enjoy the same font rendering experience for CFF fonts that they have had for years on Windows and OS X, Adobe noted. The new beta is available for download from the Git repository.